I started out the year using a free app called ClassDojo (www.classdojo.com) which is available for both your computer (web-based) or as an app for your phone or tablet. 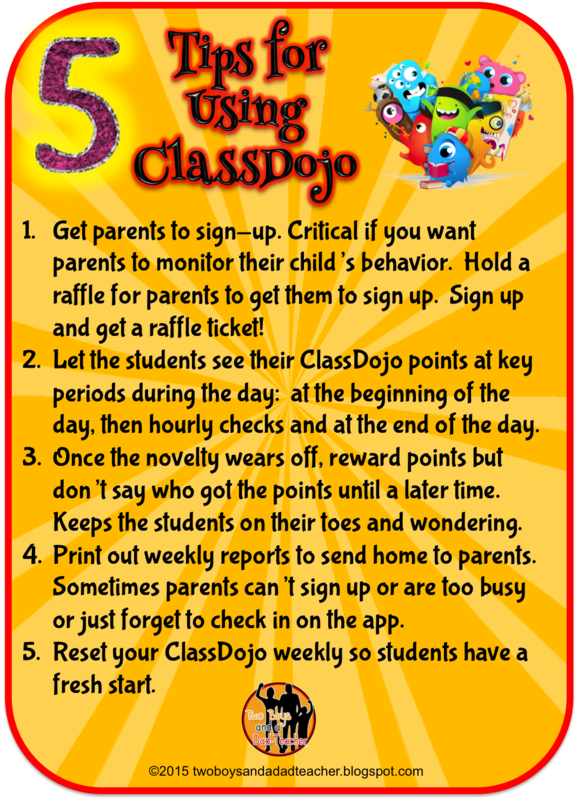 ClassDojo is a Behavior Management App (also web-based) that provides for instant feedback for students and parent notifications. 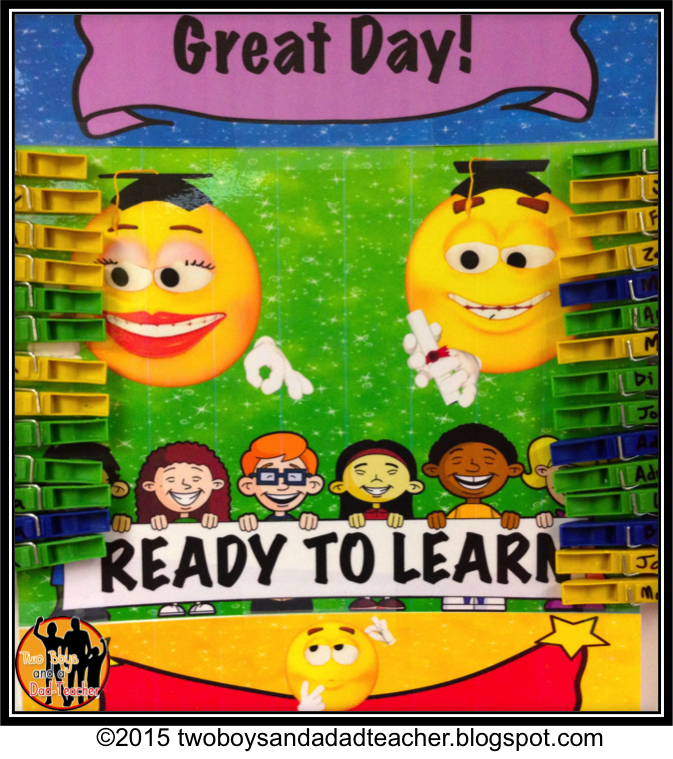 Think of it as an online behavior chart with cutesy, monster looking avatars that the students can personalize. Both parents and students can sign up for accounts through the computer or on their phones. At Back to School Night, I showed the parents the app and how I would be using it in class to promote positive behaviors. I also showed them how to sign up for a parent account so they could monitor their child’s progress. About 1/2 of the parents signed up within the first 2 weeks of formally using the program. After about 2 months, I only had 22 out of 29 parents sign up, which is about 75% of the parents. Of course, those students whose behavior was a daily challenge in my class usually had parents that DID NOT sign up. That presented a challenge. Those students were not too motivated to improve behavior because they knew that unless I talked with their parents personally, their parents were not getting the ClassDojo updates. After 5 months of using ClassDojo, I decided to switch to a classroom behavior chart. There were some drawbacks for me that did not improve behavior in my class over time. One, is that you have to have the app open on your phone, tablet or computer all the time to be able to quickly give feedback points. Leaving the app open on your phone drains the battery. I use my computer for other things during the day so opening and closing the screens was an extra step. Unless I had the app projected all the time on the screen (which meant keeping my projector on ALL during the school day — something not recommended as it uses up lamp life) the students had no idea how many dojo points they had and what their percentage was. So I switched back to a behavior chart which: provides instant feedback to the students, can be seen all day long by the students, and at the end of the week informs the parents of weekly behavior by having the students take home a chart summary that must be signed and returned on Monday. I really did enjoy using ClassDojo and many in my school continue to use it. My son’s fifth grade teacher uses it as well (in combination with a behavior chart! why didn’t I think of that!). Next year I will attempt to use it in combination with a classroom behavior chart and we’ll see how that goes. That’s the good and the bad of using ClassDojo. What are your experience with using the app? Next Post 5 Test Preps To Do Before SBAC or PAARC Testing!